Cav-1 deficiency is associated with an altered response to modified shear stress conditions. In this issue of the JCI, Yu et al. (20) have demonstrated that Cav-1 deficiency is associated with a reduced vascular response upon the alteration of shear stress conditions. Accordingly, reduced blood flow in the common carotid artery (due to ligation) was associated with reduced vessel lumen diameter in the case of wild-type animals. 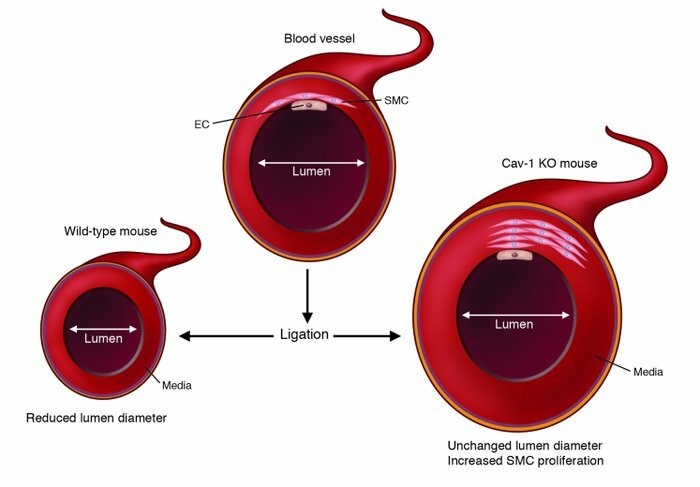 However, in Cav-1 KO mice, increased SMC proliferation was detected in the media but no change in the vessel lumen diameter was observed. Re-expression of Cav-1 in ECs alone was sufficient to eliminate this phenotype in Cav-1 KO mice.